The bar business is more competitive than ever. Customers are becoming increasingly savvy and are looking for interesting draft beers. By offering a wider tap selection, more frequent tap rotation and guest tap takeovers, you can make your bar more attractive to craft beer drinkers. Since this niche of bar customers is growing rapidly, it’s in your best interest to meet their needs. Draft beer is unique in that it’s only available at bars – You can drink bottles of beer anywhere, but if you want to get a pint of beer (which is the way it was intended to be served), you’ll need to go to a bar. Having a good selection of draft beers is an important selling point that creates a compelling reason for customers to choose your bar over your competitors. Number of rounds theory – Customers tend to think in terms of how many beers they drink as opposed to how many ounces of beer they drink. Since bottles are served in 12 oz. portions and drafts are typically 16 oz. portions, promoting draft beer can increase your check averages. Liquor cost is higher on bottled beer – Many bar owners are wary about the wastage and complexity of draft beer. While this must certainly be a consideration when determining your product mix, the reality is that liquor cost is typically about 6% higher on bottled beer. As a result, draft beer sales are typically more profitable than bottled beer sales. You actually see a double benefit when you combine the lower liquor cost with the increased cost of serving a pint compared to a 12 oz. bottle. 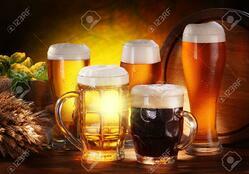 Better margin plus higher cost per beer makes selling draft beers very profitable for your bar. If you are going to cater to a craft beer clientele, you will need to get the “behind-the-scenes” aspects of this service right in order to ensure this aspect of your business remains profitable. Perhaps the most important issue to work out involves how to price draft beer. Just a few years ago, most bars typically carried between 6-10 beers on draft. 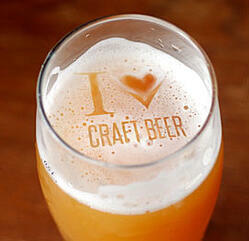 However, the rapid rise in the popularity of craft beers has had a significant impact on draft beer sales. 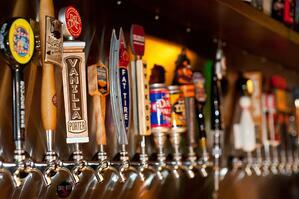 Today, many bars have 20-40 taps in order to showcase a wider variety of craft beers. Tap rotation – Many bars will rotate the beers they have on draft. A common practice is to keep about half the beers on the tap list year-round and rotate the other half periodically. While tap rotation provides your customers with greater variety, it also increases the need to update your pricing frequently. Variety of keg sizes – The traditional 15.5 gallon half barrel and 13.2 gallon half barrel (European import) kegs are still the most common keg sizes. However, the craft beer industry has given rise to smaller kegs, and many beers are now being distributed in quarter barrel and sixth barrel kegs. 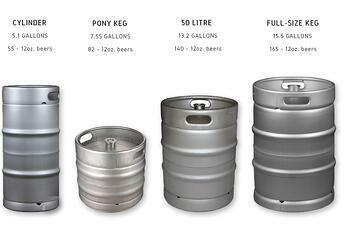 The addition of these new keg sizes can make price calculations more difficult. High alcohol beers – Many craft breweries are producing high alcohol beers that have become very popular. In order to offset the expense of these beers and due to responsible service considerations, they are often served in smaller portions (typically a 10 oz. glass for beers that are 7% ABV or higher). Experimental and rare beers can be very costly – One of Bar-i’s Denver clients, Avanti, has a strong relationship with Dogfish Head Brewery and they often carry some of Dogfish Head’s more experimental beers. Avanti recently offered Dogfish Head’s lobster special edition stout and the cost of this beer was very high. It can be challenging to price these beers at reasonable level for customers while ensuring the beer makes a respectable profit margin. All of these factors increase the frequency with which you need to make pricing decisions, and they also make these pricing decisions much more complex. When considering how to price draft beer it’s good to identify a liquor cost range that you’d like to achieve for your draft beer. Given a certain portion size and a certain cost per draft beer, what price will allow you to achieve your target liquor cost? The typical range for draft beer liquor cost is 20% to 26%. Keep in mind that this cost may be slightly higher for fast casual establishments and dive bars that are forced to compete on price, and the liquor cost may be slightly lower for higher end bars, venues, and stadiums since they have the ability to charge a higher price per beer. Tax – You need to back out the tax because it’s money that you don’t take. You’ll need to consider this when determining how to price your draft beer. Portion sizes – A 14.5 oz. pour in a 16 oz. glass is standard (this allows for head). A 10 oz. pour is typically standard for beers with an alcohol content of 7% or higher. Strategic pricing considerations – You can run higher costs on more expensive beers since you can still make more per drink (more on this below). * To calculate this cost per beer, divide the number of ounces in the keg (1984 oz.) by a 14.5 oz. serving. This will give you your wholesale cost per pint. ** If you’re aiming for a 20% liquor cost simpy multiplying the cost per beer by 5 will give you the price to charge to each customer. This is the price you need to charge per beer based on the cost of the keg and serving size. You should always round up to a more sensible and convenient price for the customer. *** Keep in mind that the while the liquor cost is set at 20% in this example, the actual profit per beer increases as the cost of the keg increases. The most common area on this chart for typical craft beer kegs is the $100-$120 price range. If you’re serving higher end beers and making a larger profit margin on each beer, it’s an opportunity to de-emphasize liquor cost and price these beers more aggressively. The reason for this is that you’re still going to make more money per beer when you sell high end beers. If you can price them more aggressively, these beers will stand out in terms of value which should entice more customers to purchase them. Ultimately, this will result in selling more beers that yield a high profit per beer (though at a lower margin). On the other hand, if you price your low end beers more aggressively, it will most likely cause you to increase your sales of these lower profit margin items. Therefore, by pricing your high end beers more aggressively, you can boost your overall profits and draft beer sales even though your margin per beer will be a little lower. When thinking about your target liquor cost, you may want to shoot for 20% on low end beers but aim for a slightly higher liquor cost on high end beers (approximately 25%) since it will benefit your profitability in the long run. Divide the cost per keg by the number of beers to determine the cost per beer. For example, $100 keg/137 beers = 73 cents per beer. Divide the cost per beer by the sale price per beer. For example, $0.73/$4.00 = 0.18 or 18% cost. Simply click the image below to instantly download our Excel based Draft Beer Pricing Calculator for FREE! To receive customized recommendations for how to price draft beer at your bar or to schedule a free profitability consultation, please contact Bar-i today. We serve bars and restaurants nationwide from our offices in Denver, Colorado.